The recent discovery of more than 15,000 dead pigs in the Huangpu River has brought the issue of water quality and food safety into the public eye. However, the focus has been on human health issues. We should also consider the vulnerability of China’s rivers and the enormous variety of species whose survival depends on clean and abundant freshwater resources. Last month, the Ministry of Agriculture announced that there are just 1,000 finless porpoise remaining in the Yangtze River, its tributaries and adjoining lakes. More shocking is the rare species' 13.7% annual rate of decline. At this pace, the science suggests the Yangtze finless porpoise could be extinct within 10-15 years. The Yangtze finless porpoise has thrived in the main stem of the Yangtze River for about 300,000 years and is the only remaining freshwater subspecies of the narrow-ridged finless porpoise in the world. However, excessive exploitation of the resources in the Yangtze basin has pushed this rare mammal to the brink of extinction. The Yangtze is home to 400 million people and is the engine that drives roughly 40% of the entire Chinese economy. Economically, the Yangtze basin is thriving (at least for the time being). But at what price? Ecologically, the Yangtze is very unhealthy – if it was a human patient it would be placed in the in the intensive care unit. Close to 56% of China’s freshwater fish catches come from the Yangtze, but recent evidence suggests that the river’s declining health is having a serious impact on four species of carp that often grace the dinner tables of the nation. Alarmingly, fry from these “big four” have declined by up to 95% in recent years due to river-lake disconnection, illegal fishing, pollution and water infrastructure development. This doesn’t just mean less food for people, it also means that fish and birds will lack food vital to their survival. Complicating matters further is the fact that the main breeding grounds of the finless porpoise are in Poyang and Dongting lakes, the dredging ground for sand used to make the cement that’s helping to fuel the construction boom in many cities along the course of the river. However, there are glimmers of hope. In the spring of 2012, after finding dozens of the mammals dead in the Yangtze, including about 12 in Donting Lake, the provincial government of Hunan enacted a regulation to protect the species. This new regulation means that, for the first time, the annual performance assessment of local officials will be associated with the safety of the dolphin. 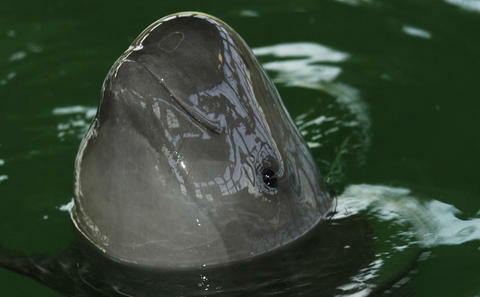 The challenge is that Dongting Lake only contains a fraction of the finless porpoise population. We must do more to ensure the species survives. Scientists estimate that if the number dips under 200 animals, the species will be unable to survive. One solution is ex-situ conservation, where a number of animals are isolated on a portion of the river and provided with a safe habitat to thrive. The Shishou Tian-e-zhou Oxbow National Reserve, established in 1992, is the first ex-situ reserve for dolphin in the world. It differs from traditional ex-situ conservation, in which the animal would be transferred to an area that is not its natural habitat, in that the habitat in Oxbow (once part of the river) is nearly the same as in the Yangtze main stem. With support from WWF and the Institute of Hydrobiology of Chinese Academy of Sciences, the original population of five porpoises has now increased to over 40 animals. With five to eight calves born annually, the proof is in the Oxbow, and shows that with the right conditions, the finless porpoise can thrive. 1. A push for finless porpoise conservation along the main stem of the Yangtze. This is extremely challenging given the pressures, but must be done. 2. Establish ex-situ sites closed off from the main stem of the Yangtze, which can serve as a protected habited to ensure the survival of a viable population. The Hubei provincial government has already identified one additional site besides Tian-e-Zhou located at Jianli County. Even getting this site reviewed and prepared will take up to two years. 3. Ensure the finless porpoise is classified as a Level 1 species at the national level. This will ensure that there is focus on ensuring the long-term viability of the species. It has only been six years since the Baiji dolphin was declared functionally extinct in the Yangtze, and it looks very much like its close relative, the finless porpoise, is heading in the same direction. Scientists have concluded that the finless porpoise won’t survive in the main stream of the Yangtze without support. It is time to work collectively to ensure the Yangtze finless porpoise does not suffer the same fate as the Baiji. Overfishing, dam construction and pollution spell ecological crisis for the Yangtze – and fish are at the heart of it, says Cao Wenxuan. Catches of the four main species in the South China Sea – the Japanese Spanish mackerel, eel and the large and small yellow croaker – have plummeted. The Tibetan plateau’s Zoige wetlands, a crucial water source for the Yangtze and Yellow Rivers, continue to deteriorate despite conservation efforts. Volunteers and officials have stepped up the fight against bird poaching on China’s largest freshwater lake. But it's a losing battle, writes Yang Xiaohong. A birdlife sanctuary that’s also a fishery, and whose staff spend their time scaring herons away – welcome to Inner Mongolia's Dali nature reserve.